Your tomato plants are tall and green; you’ve taken the time to carefully stake or cage them to support their growth. Right now they are loaded with tons of green tomatoes, and some of them are just starting to blush red. And then three days later, it all goes horribly wrong. There is nothing more disheartening than to see that all of your ripening tomato beauties (or peppers or squash) are now rotting from the bottom—right on the vine! Blossom-end rot looks like a discolored, watery, sunken spot at the blossom end of the fruit, most commonly tomatoes. The spot will start out small, and grow larger and darker as the fruit continues to grow. Blossom-end rot can quickly cover half the fruit, making it totally inedible. Secondary diseases or mold can also form on the affected areas, overtaking the entire fruit. 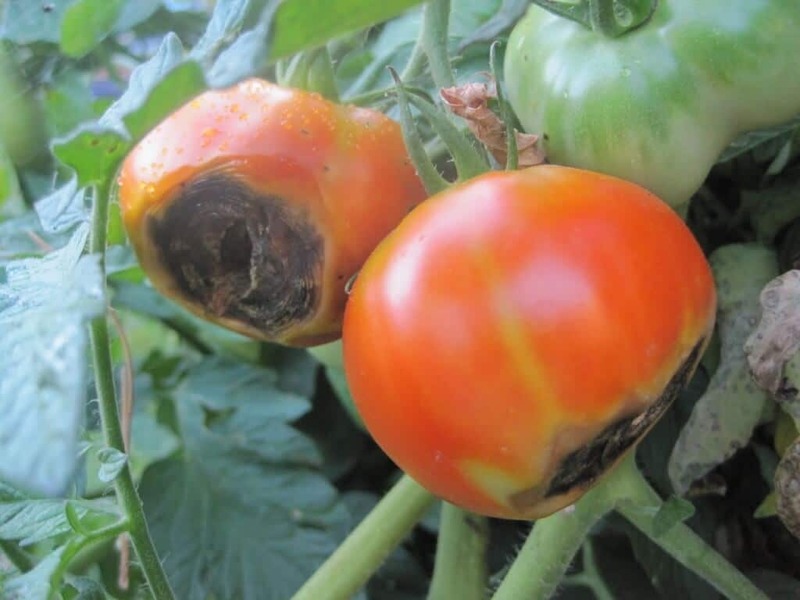 Blossom-end rot is more common if you planted in cold soil or when your garden experiences extremes in soil moisture levels—either too dry or too wet. 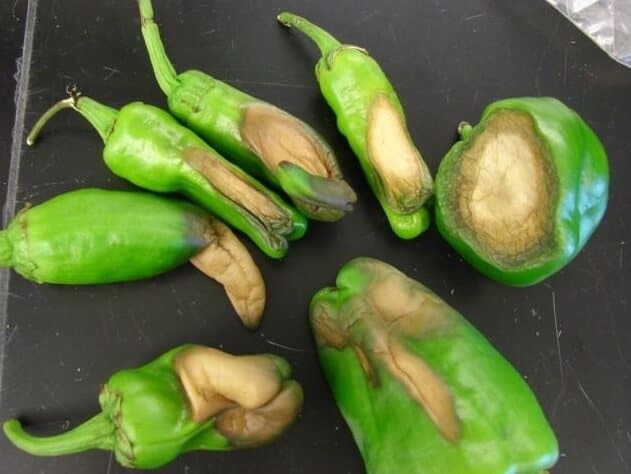 Blossom-end rot is a disorder caused by calcium deficiency in the plant. While this may be a result of low calcium levels in the soil, more often than not, it is the result of erratic watering. When the plant is allowed to get too dry, or is given too much water over a period of time, its ability to absorb calcium from the soil is greatly diminished. In other words, your soil might have plenty of calcium, but it just isn’t bioavailable and being taken up and utilized by the plant. Over fertilization, especially with high nitrogen fertilizer, can also cause blossom-end rot. Over fertilization can cause such rapid growth that nutrients such as calcium won’t be able to keep up with the growth. Always soil test before fertilization and fertilize according to the results. You can also choose varieties of tomato that are resistant to blossom-end rot. Varieties of tomatoes that produce large fruit tend to be more susceptible to blossom-end rot, while varieties with smaller fruit are less likely to suffer it. Blossom-end rot is much easier to prevent than it is to cure. Once it has set in, it can be really hard to reverse, but there are a few things you can do that have a good chance of turning things around. 1. Make sure your soil isn’t allowed to dry out. The best defense against blossom end rot is a nice, consistent soil moisture level. 3. Mulch. By adding a three-inch layer of organic mulch, you can help maintain adequate soil moisture levels, even during dry spells. It is best to add the mulch after your soil has warmed in the spring. 4. Plant susceptible crops (such as tomatoes, melons, squash, peppers, and eggplants) in well-drained soil that has been amended with compost or well-rotted manure. Soil amended with plenty of organic matter will retain moisture better and supply plenty of nutrition (including calcium) to your plants. In addition to making sure you have consistent moisture levels in your soil, you can fortify your plants when you put them in the ground to make sure they get plenty of calcium throughout the season. 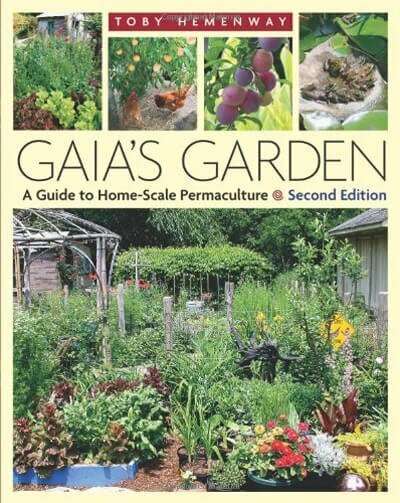 Many people use garden lime to adjust their garden pH and add calcium at the time of planting. This will treat the entire garden soil. (If your soil pH doesn’t need adjusting, use gypsum instead of lime.) You can also add 2-3 Tums tablets or other calcium carbonate antacid to each planting hole to add extra calcium. I personally like to use a teaspoon or two of eggshell calcium to each hole as I plant my tomatoes, peppers, squash, etc. This is a great way to use up a common food waste product. Here’s how to make it. If you already have signs of blossom-end rot, you can make a solution from 2-3 calcium carbonate antacid tablets, 8 ounces of milk and a quart of pure water, and irrigate your plants with it daily to help keep blossom-end rot from destroying more of your crops than it has to. This might help turn things around, but isn’t foolproof. Don’t bother with the calcium sprays at the garden store that promise to stop blossom end rot. While they can help with other issues related to nutrient deficiency, to stop blossom end rot, the calcium has to come up from the soil through the roots, not through the leaves. Prevention is really the cure here. Good, fertile soil and consistent watering can make all the difference in stopping this heartbreaking problem before it starts and ruins your crops. Get your soil tested each spring, and amend it accordingly. This is great for farmers using non-organic methods who have access to tissue analysis labs and drip injection systems! The best time to get a soil test is in the fall. If the directions tell you to add lime, you can do it a couple months in advance of planting. I only get my soil tested every couple of years as recommended by my state university. I personally think blossom end rot is mainly due to inconsistent watering. I agree it is most likely inconsistent watering. I have grown super crops of tomatoes without blossom-end rot or fussing with mineral content of the soil. However, that was in a part of the country where temperature and humidity variations over summer were not extreme. Now I am in the Willamette Valley of Oregon experiencing century-high temperatures (F) and cool nites. Temp varies as much as 45 degrees between day and night and humidity up and down by 30 points. Makes it impossible to water consistently; early morning watering is evaporated by high noon deep down. Without a drip system, would probably have to do light watering about 4 times a day to keep ground at the consistent moisture level required to avoid blossom-end rot. Water quality is one of the variables which makes general recommendations difficult in matters vegetable or animal. The calcium content and chemical residuals in water should be the concern of research institutions but I have yet to run into an Ag prof. or even a Med. School prof. who does more than brush off the subject. We are having this problem here in Alpena Michigan this year and are trying the TUMS cure. It’s been an odd year weather wise but our plants are producing like crazy. We are also wondering as we use a rain water catch basin if this may have anything to do with things. If the rain is acidic and we are using it, can that also contribute to BER? Collecting rain water gives us about 110 gallons per good storm…would hate to think our free supply is harming our plants. Thank You if you resond. Your rain could be acidic, but most plants want conditions to be slightly acidic. The problem is not so much the acidity as it is the lack of calcium in the soil and the moisture to dissolve it. Keep an eye on your soil pH. You’ll want it to be 6-6.5 ideally, for most plants.